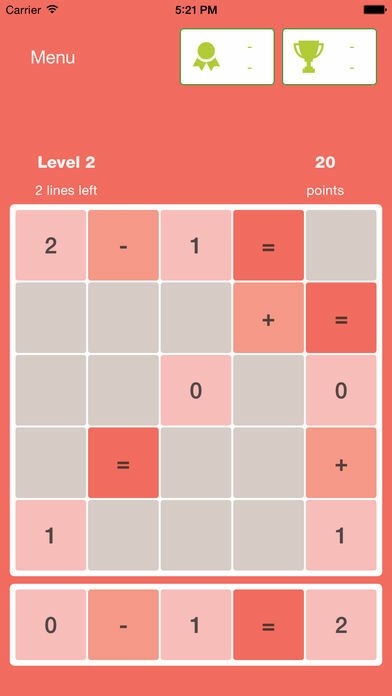 With Arithmetis, children and adults can engage in a simple to understand maths game that starts off easy but builds up to a formidable challenge. Arithmetis gamifies mental-arithmetic practice and reasoning and does so in a way that builds up to be challenging but starts out very accessible indeed. If a child can create number sentences using 1 and 0 with addition or subtraction, they can do level one. The second level increases the choices to include 2, the third level 3 and so on. As the 10th level is the final one, it is clear that the arithmetic never becomes extremely difficult but is instead complicated by the unavailability of all of the numbers at a time. To use them, the numbers and signs from the given options are placed on a grid of limited size. To get a new number you must place an existing option on the grid but do so in a way that you think will become useful later. A player's game usually comes to an end when none of the available numbers completes a number sentence and there is no space on the grid to place what is on offer. 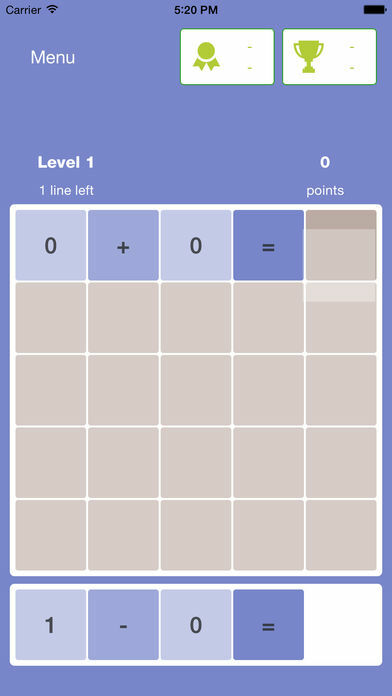 The type of arithmetical reasoning that is exercised in the app is different from what can be covered in traditional methods of maths practice. There is an element of chance but one that can be mitigated by keeping in mind the possible numbers and where might it be best to place an as yet unusable digit for use in a future number sentence. This reasoning also emphasises that the positions of the different numbers do not make a difference in addition but that they do in subtraction. It is down to the player to realise when there is no further possibility to continue and so restart the game. This is contrary to how similar styles of games work which detect when a dead end has been hit, so it can feel a bit confusing on the first use of this app. There are coins that can be earned in the game that allows players to adjust the play state a little and perhaps buy them the chance to advance a little further towards the final goal of level 10. Arithmetis is free and without in-app purchases although at the cost of an interstitial advertisement. This appears as a full screen each time a game ends and is time delayed so that it cannot be skipped for a few seconds. Children are used to this type of thing from other games and apps so it is not a problem for home use but, if you're a teacher adding to your school's app library, your school's I.T. policy might conflict with it. This app is free, quick to download and makes only a small dent in your device's storage capacity. It offers an interesting mathematically-based challenge that, while not likely to offer prolonged entertainment, is ideal for short distractions with frequent revisits as players attempt to better their last performance. Parents looking for an educational challenge for their children should definitely check out this app on their own phone or tablet. It is ideal for passing time in waiting rooms or on long journeys. Both teachers and parents can harness the competitive drive of children to encourage future practice and the chance to beat both other children and maybe even parents and teachers themselves. Can you count to ten? Prove it! The Arithmetis puzzle game allows everyone to work mental arithmetic and youngers review the additions and subtractions. Of increasing difficulty, the first levels are widely accessible to children while offering challenges for adults. The last few levels are the ones more difficult to complete.